The Montgomery County Education Association (MCEA), in its latest round of endorsements, has opted not to support the re-election bids of two current members of the state legislative delegation: District 17 Del. Jim Gilchrist of Rockville and District 19 Del. Marice Morales of Silver Spring. Meanwhile, the politically influential union—which represents about 14,000 teachers and other educators in the county school system—formally announced its endorsement of Del. Jeff Waldstreicher of Kensington in the competitive three-way contest for the District 18 Senate seat. That post is now held by Democrat Richard Madaleno, a candidate for governor. The latest MCEA endorsements, disclosed late Monday, also tapped eight non-incumbent candidates vying for seats in the county’s 24-member contingent to the Maryland House of Delegates in the June 26 Democratic primary. Included in these endorsements are Kevin Mack of North Potomac, an aide to U.S. Rep. John Delaney, in District 15; Rockville City Council member Julie Palakovich Carr and attorney Julian Haffner of Gaithersburg in District 17; former congressional aide Jared Solomon of Chevy Chase in District 18; attorneys Marlin Jenkins of Silver Spring and Vaughn Stewart of Derwood in District 19; educator Darian Unger of Silver Spring in District 20; and union organizer Gabriel Acevero of Montgomery Village in District 39. Outside of Gilchrist and Morales, the MCEA now has endorsed the candidacies of all other state legislative incumbents—14 delegates and six state senators—seeking re-election this year. All MCEA endorsements will appear on the so-called “Apple Ballot,” which is widely distributed at polling places. District 15 (Bethesda through Potomac north to the Frederick County line): Mack, Delaney’s district director for the past five years, and Lily Qi of North Potomac, a top aide to County Executive Ike Leggett, are regarded as the frontrunners among seven non-incumbents taking aim in the primary at the seat now held by Del. Aruna Miller of Darnestown. Miller is running to succeed Delaney, who is leaving to pursue a bid for the 2020 presidential nomination. The MCEA’s backing gives Mack his first major organizational endorsement; Qi last month garnered the support of the Sierra Club, another coveted endorsement in county politics. The MCEA had previously given its support to Dels. Kathleen Dumais of Rockville and David Fraser-Hidalgo of Boyds in their bids for re-election to the district’s other two seats. It also has endorsed state Sen. Brian Feldman of Potomac, who is favored to win renomination over businessman Hongjun Xin of Potomac. District 17 (Gaithersburg and Rockville): Palakovich Carr, a biologist by profession, and Haffner, affiliated with the Bethesda-based law firm of Longman & Van Grack, received the MCEA endorsement for Gilchrist’s slot and the seat now held by retiring Del. Andrew Platt. The union also is backing both Del. Kumar Barve of Rockville, who has served for almost three decades in Annapolis, for re-election, plus Sen. Cheryl Kagan of Rockville, who has no primary opposition in her bid for a second term. The union offered no public explanation on why it chose not to endorse Gilchrist, a three-term legislator who received the MCEA’s nod four years ago. The son of the late Charles Gilchrist, a former state senator who served as Montgomery County executive from 1978 to 1986, Jim Gilchrist has been a low-profile member of the county’s legislative delegation since his election in 2006. He came within 90 votes of being denied renomination in the 2014 primary—the closest call for any Montgomery County incumbent that year. Also passed over in the MCEA endorsement process was county Board of Education member Rebecca Smondrowski of Gaithersburg, who entered the District 17 primary following Platt’s surprise retirement. Smondrowski also did not receive MCEA backing in winning her initial election to the school board in 2012. Barve and Gilchrist are running together on a slate that originally included Platt; they moved quickly to place Palakovich Carr on the slate after Platt’s decision to step down. Palakovich Carr now adds the MCEA’s backing to her previous endorsement by the Sierra Club. 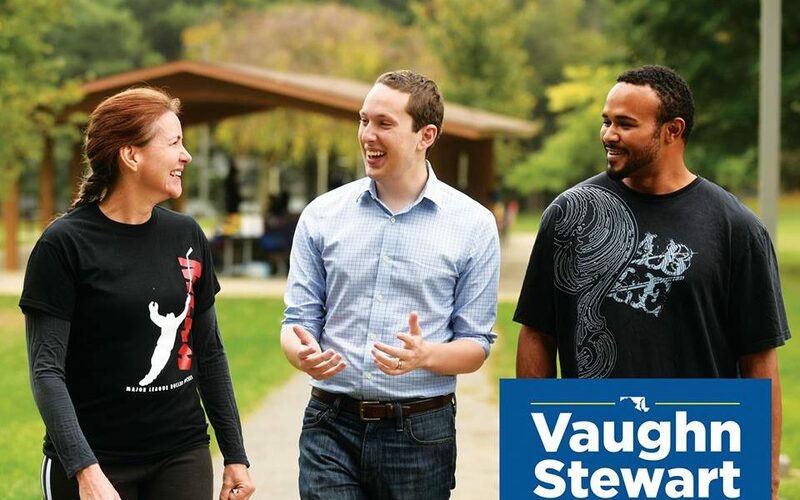 District 18 (east Bethesda through Chevy Chase to Silver Spring, including Garrett Park, Kensington, Wheaton and a portion of Rockville): Waldstreicher’s run for state Senate and Del. Ana Sol Gutierrez’s bid for a County Council seat have opened up two of the district’s three delegate seats. Solomon, a onetime teacher in the Baltimore city school system, becomes another non-incumbent to claim both the MCEA and Sierra Club endorsements. But the MCEA opted not to make an immediate endorsement for the second District 18 open seat, and plans to conduct further interviews before making a decision, according to sources. One factor in this move appears to have been grumbling from several candidates—who complained of inadequate opportunity to be considered for the MCEA endorsement, due to lack of notice or late entry into the race. In backing Solomon, the MCEA parted ways with another major county union, SEIU Local 500, which represents about 12,000 support staff in the county schools. Local 500 has endorsed Montgomery County Democratic Central Committee Vice Chair Emily Shetty of Kensington and former University of Maryland project manager Mila Johns of Chevy Chase for the two open delegate seats. Del. Al Carr of Kensington, the only incumbent in the eight-candidate primary field, previously received MCEA backing. Waldstreicher adds the MCEA’s backing to that of several other unions—including IAFF Local 1664, which represents the county’s career firefighters. SEIU Local 500 has lined up with another Senate candidate, activist Dana Beyer of Chevy Chase. The race flared up last week when a contender for delegate, Helga Luest of Rockville, charged that Waldstreicher had sought to convince her to switch to the Senate race—“presumably” to splinter support for Beyer. Waldstreicher has denied Luest’s allegations. District 19 (Silver Spring north to portions of Rockville and Gaithersburg): The MCEA’s backing went to Stewart and Jenkins for the seats now held by Morales and Del. Ben Kramer of Derwood. With the MCEA’s backing, Kramer is running unopposed in the primary for the district’s open Senate slot. He would succeed Democrat Roger Manno, another contender for Delaney’s congressional seat. Stewart—who now has both the MCEA and Sierra Club endorsements—and Jenkins are among a half-dozen non-incumbents running for delegate in the District 19 primary. The other MCEA endorsement in the district previously went to Del. Bonnie Cullison, who is seeking a third term. Cullison is a former MCEA president, and Jenkins has strong ties to organized labor as well: He is a staff attorney for the American Federation of Governmental Employees. According to sources, the MCEA decision not to back Morales for re-election followed a contentious interview session in which she and union officials differed over the best course for the county school system’s English for Speakers of Other Languages program. Morales is seeking her second term; she initially won election in 2014 without MCEA backing. District 20 (Silver Spring/Takoma Park): The MCEA endorsement of Unger—a Howard University business professor and civic activist—is a switch from four years ago, when he failed to get that union’s backing in his first run for a delegate seat in the district. He is among five non-incumbent contenders eyeing the seat of retiring Del. Sheila Hixson. The District 20 incumbents seeking re-election—Sen. Will Smith and Dels. David Moon and Jheanelle Wilkins, all of Silver Spring—previously received MCEA backing. District 39 (North Potomac through Germantown and Montgomery Village to Clarksburg): Acevero adds the MCEA’s backing to that of SEIU Local 500 and UFCW Local 1994 MCGEO. The latter union represents the majority of county government employees, and Acevero works there as a field organizer. Leggett is strongly behind Acevero, pitting him against the District 39 incumbents seeking re-election: Sen. Nancy King of Montgomery Village and Dels. Kirill Reznik of Germantown and Shane Robinson of Montgomery Village. They have added communications specialist Lesley Lopez of Germantown to their slate. Acevero and Lopez, who has the backing of both the Sierra Club and the Maryland League of Conservation Voters, are among five non-incumbents taking aim at the seat of Del. Charles Barkley, who is running for County Council at-large. The MCEA, while differing from the incumbent legislators, on their choice to fill Barkley’s seat, has nonetheless given its endorsement to King, Reznik and Robinson for another term. In the county’s other two legislative districts, the MCEA previously endorsed Sen. Craig Zucker of Brookeville and Dels. Anne Kaiser of Silver Spring, Eric Luedtke of Burtonsville and Pamela Queen of Olney for re-election in District 14. In Bethesda/Chevy Chase-based District 16, the union is behind Sen. Susan Lee and Dels. Ariana Kelly and Marc Korman, all of Bethesda, as well as Samir Paul, a Bethesda resident who teaches computer math at Montgomery Blair High School in Silver Spring. Paul is among five non-incumbent contenders eyeing the open seat of Del. Bill Frick, a candidate for county executive.